If you want your blog to be popular and get loads of free traffic from Google & social networks, it’s essential to create a steady stream of interesting and compelling blog posts. Doing this week after week, however, can seem like a challenge. Many bloggers start off with boundless enthusiasm but then feel like they are running out of blogging topics after a few months. There are, however, many sources from which you can draw inspiration. No matter what your topic, the list of topics you can blog about is virtually endless. The reason for this is that there are always new ideas, news and developments coming out in every field. In this article, we’ll be looking at some of the best ways to come up with great blog ideas. For me, content is the main way I make money from blogging. Content brings traffic to my site, and then I monetize that content with affiliate offers or display ads. Have a look through some of my content ideas to help you gain more traffic to your website through organic, referral links and social sources. Feel free to add any more ideas in the comments section below. 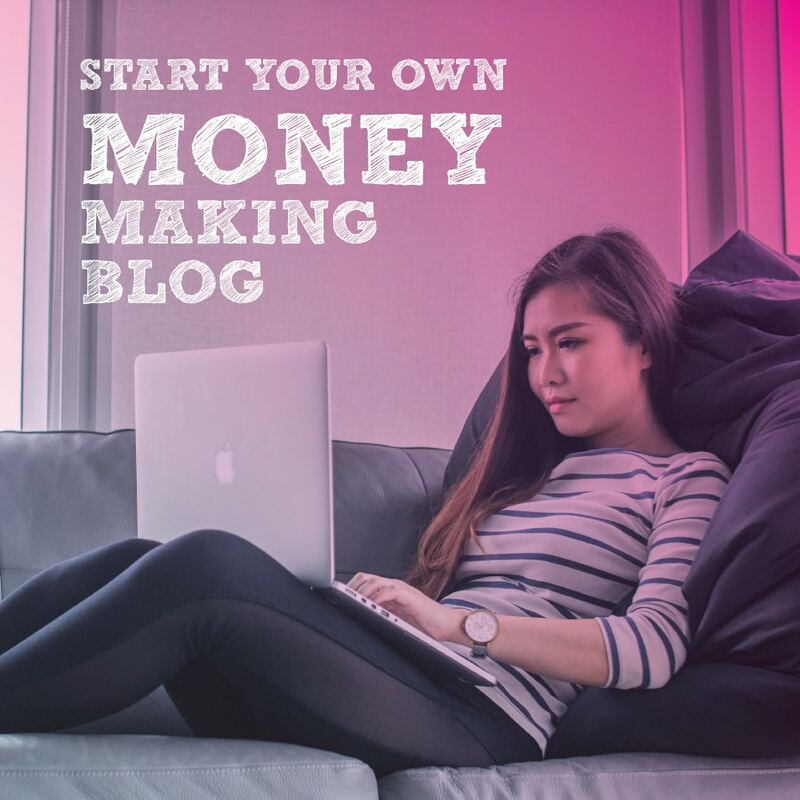 If you are yet to start a blog, then why not head over too my easy to follow tutorial on how to start a blog, and get up and running in just 30 mins. Share my blog ideas with this embed code! Here’s the list of URLs of content examples and blog post ideas that are mentioned in the graphic above. Compile a Top ten best / favourite blog posts from other people’s blogs. Come up with the top 25 or 50 people to follow on Twitter within your niche. Bring attention to influencers in your industry and other colleagues, friends or accounts you discover that are sharing valuable content. It’s a great resource for your followers and it’s a great way to get people to notice you and many are even likely to reciprocate. Ask people for ideas. Ask for their opinion on what you could create. Ask a handful of questions to someone that is interesting / authoritative within your niche. It doesn’t have to be face to face. It could be via Skype or email. The great thing is you don’t have to write it yourself. The interviewee creates the content for you. This is also a good relationship building exercise. Get ideas from sub-reddits within the niche your website resides. Ask a handful of people a couple of questions ( interesting ones that people want to hear ) and create a group interview post. Invite well respected bloggers to write on your site. This way they get access to your audience and you have a great article on your site for free. Contact the smaller blogs that could do with the exposure and invite them to guest post on your site. Create a post, infographic or video that people will find useful. If your website is in the photography niche, why not create an Instagram Tips infographic. Create resources that people find useful and you have a web asset that will always attract traffic. Cover an experiment you are testing with your blog or audience. Or you could write about a success or failure that you’ve experienced within your niche. Give your opinion on a product or service you use. You can sometimes earn money if there is an affiliate program for that product. Look back at some of your most successful posts and why they did well. Look on sites like Visual.ly for inspirational infographics and write about them. Or you can do a Google search for infographics that focus on subjects that cross over into your niche. Repurpose an old list article into a Slideshare or Infographic. Update an old blog post with new information. Partner with a business to offer prizes for your readers through competitions or cool stuff like games and quizzes. What are the less well known technical terms or acronyms in your niche. Helpful resource for novices are always worth doing and will attract traffic. What the general election can teach you about content marketing. What the Super Bowl can teach us about keeping fit. Share your favourite music with your readers. Invite your readers to submit questions about you or your blog and answer them. There’s so much information out there on the internet that is out of date. Look for out dated content in your vertical and update it. Check out this handy tool from Green Lane SEO! A compilation of useful resources regarding your industry can create a one-stop shop for your customer base. If your audience has to come through your site or blog to access these resources, they may end up staying for a bit of a read and a bit of a shop. Share the top 10 articles you think your readers will enjoy. Put the spotlight on other people in your vertical. Build up relationships with other bloggers. Check what’s hot, what people are searching for to get some ideas on creating content for your blog. Promoting your own eBooks on your blog can be a great way to make money, build an email list and showcase your knowledge. A useful 404 page will help your visitors find their way around your site if they accidentally end up on the wrong page. Alternatively a creative or fun 404 page can be a great way to get your name out there. Crush those myths and let your readers know the truth. Use your audience to create new content ideas and data. Use the data for follow up articles and infographics. Look at some of the big changes that might happen in your niche 12 months or 5 years from now. A listicle is an article in the form of a list; listicles are heavily used by websites such as Buzzfeed and are incredibly popular due to the bitesize nature of the information shared. An example of their efficacy is you, reading this listicle, right now. When you probably should be working instead. Creating the right content at the right time can get you a ton of attention. Whether it’s Valentine’s Day, Christmas, or Halloween, you can create holiday themed content that can get a ton of attention over a short period of time (and every year after). Look back at some of your decisions and why they didn’t turn out as you hoped. Write an A to Z post about something within your niche. Example: A to Z of photography Tips, A to Z on The Best Universities in The World. Is there someone in your niche you admire? Write a profile on them detailing who they are, what they do, why you love them, and where your readers can learn more. Use a quiz-building application like Online Quiz Creator, and make your next post into a game for your readers. Compile the best life hacks within your niche. People love this kind of content and will link to and share. If you have something valuable to offer within your niche then why not share some of your training and consulting material with your readers via a live online workshop or pre-recorded video. Find questions people are asking in your niche or industry and try to answer them on your own blog. Create a short answer on Quora with a link through to the full answer on your blog. Your tool doesn’t have to be an expensive piece of software. It could be something simple that helps people speed up a common task. A White Paper is a detailed guide on a particular subject. A Whitepaper is a great way to establish your credibility as an expert and positioning you as the perfect person to solve their problems. These are infographics that teach you how to do something. You might create a 10-step process to create a particular tool or product or digital media such as a podcast. This could be in the form of a blog post with animated gifs to document in a funny way the day in the life of any given person or job. You could create a post about The Day In The Life Of A Designer or anything that is realted to your niche. Find content that is no longer on the web and re-create & publish it on your own site. Instead of trying to cover news first, see if you can take advantage of currently hot topics through newsjacking. This is the practice of looking for new & upcoming stories then capitalizing on them by writing up a blog post on the topic. Live Example: Check out the post on Triple SEO on NewsJacking to fully understand this content idea. I actually find your infographic idea really smart, a nice way to present content and ideas with screenshots, proves that infographic don’t have to be complicated to work. Oh Wow!!! This is fantastic! So many new ideas which I didn’t know. I am new with blogging but really like to get into it more. This will definitely clear my mental block. Thank you so much for sharing Jamie! Thanks for so many fantastic ideas in one place, Jamie! I usually get inspired by friends and competitors, but thank you for mentioning Reddit! Will definitely try that. This is really great!! Thanks for sharing these fantastic ideas and now i got lots of new ideas for the blogging. Thanks for a great selection of ideas! The idea of ​​creating a glossary I liked most of all. Also, I often create FAQs on different topics. It perfectly helps not only to study the niche but also to create useful and interesting content for my users. These are the best ideas I have ever read. As a starter, I was so confused but now I think I can work better..
And how simply you have defined each one of them….